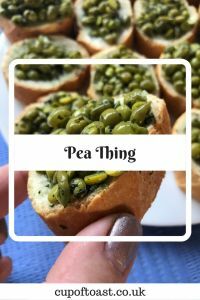 Yes, you read that right, I really have decided to call this ‘Pea Thing’. On the back of a conversation with a friend we thought that it was both fitting and memorable. So, here are the ingredients and method for ‘Pea Thing’. Sure to go down well at summer buffets! 200g peas (I use frozen peas which I defrost in the fridge overnight). 1 dessert spoon of mint sauce. 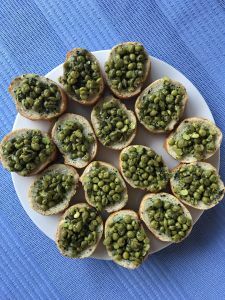 Plain sliced baguette (leave covered for an hour before adding the pea mix so that it is slightly hard on the surface), or bruschetta. 1. Mix the peas, lemon, garlic and mint sauce together in a bowl. 2. 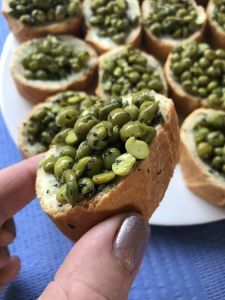 Press together with the back of a spoon to lightly split the peas. 3. Leave to cool in the fridge for half an hour. 4. When chilled, transfer one soup or dessert spoon serving and press onto the bread. 5. Serve on a plate or platter and enjoy!